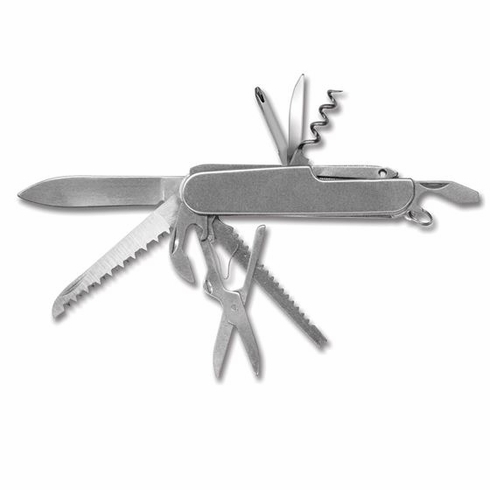 Stansport 8535 12 Function Folding Pocket Knife- Stainless SteelStansport, 12 Function Knife- Stainless Steel, Item # 8535, Contains: Phillips head screw driver, cork screw, bottle opener/screw driver, can opener, scissors, nail file, pipe cleaner, 2.25 inch saw, fish scaler, leather awl, and a 2 inch knife blade. Durable rust resistant stainless steel. •	Leather Awl, and a 2 Inch Knife Blade.